[Updated March 2015] Went back Ryoshi Sushi Ikeikemaru and glad to see that prices were still quite affordable (though it was increased slightly). Lunch sets were easily below $20, of course that would depend on what you order. The waiting times could be erratic though. My colleague’s Sashimi Bento came in about 10 minutes, while my tempura easily took 15 minutes later. Take note of their system: The coloured plates would represent the usual sushi you take from the conveyor belt, while white plates left on your table would be for ala carte dishes. 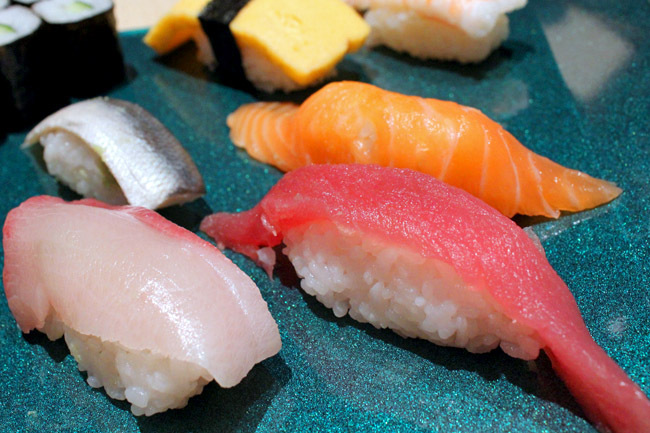 These days you can’t get quality sushi at reasonable prices, most ‘authentic’ restaurants coming with steep price tags. And the cheap ones taste, well, cheap. 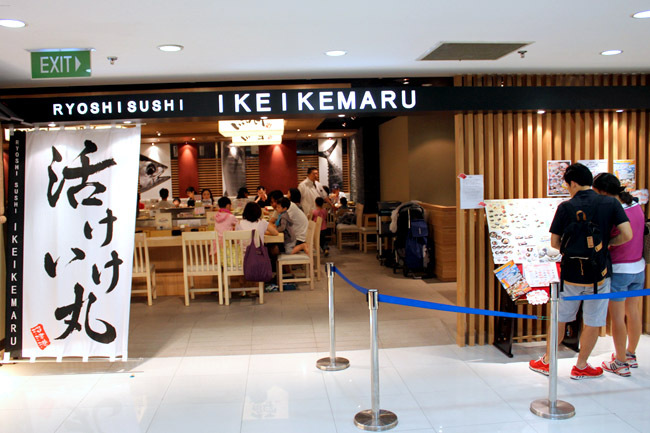 Until I found Ryoshi Sushi Ikeikemaru at Liang Court, with sushi such as Ebi Prawn, Mongo Ika Cuttlefish, Tobikko Fish Row and Inari priced at $1.80 for two pieces. Even the more expensive selections Maguro Tuna, Anago Sea Eel, and Shimesaba Mackerel are at $3.80 for two. 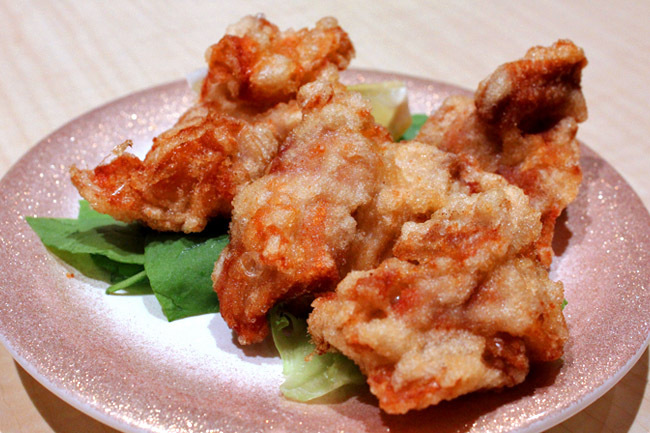 The fish comes from a variety of places, with most shipped in from markets in Hokkaido. 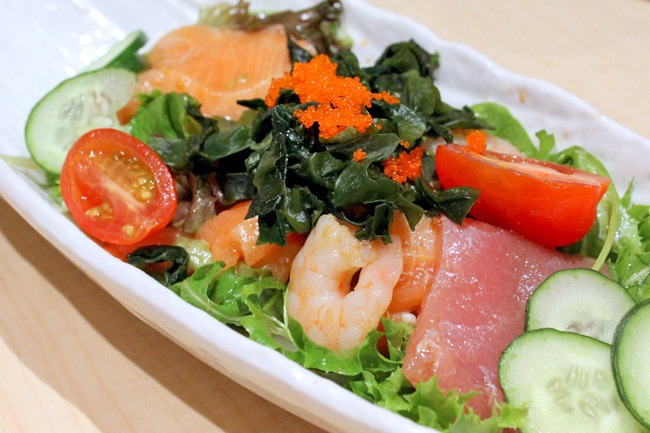 Shipment arrives on Tuesday and Thursday, so plan your days if you want the freshest sashimi. 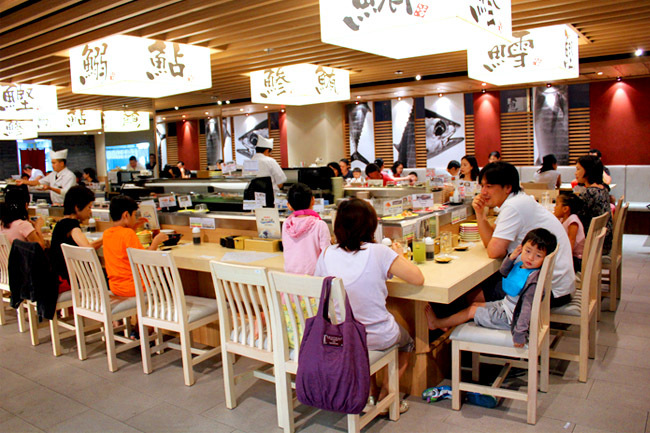 You may frown upon conveyor sushi belts, like “how good can the sushi be really?” Ryoshi Sushi Ikeikemaru surprisingly is a notch better than the usual brands, boosting of Japanese chef and Japanese-speaking staff. Most of the customers seem to be Japanese as well. 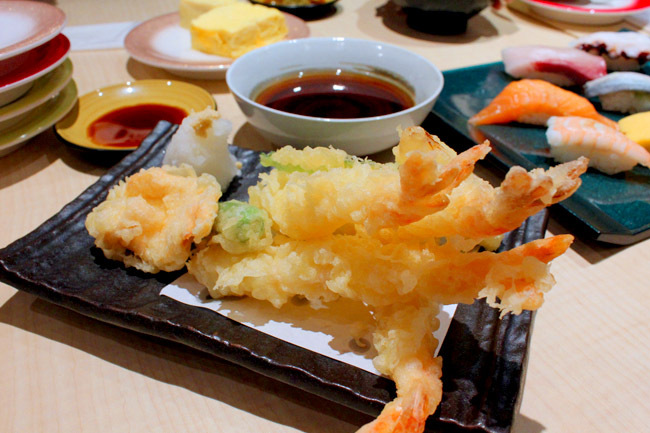 I have been told again and again if you spot real Japanese at a Japanese restaurant in Singapore, just go for it. 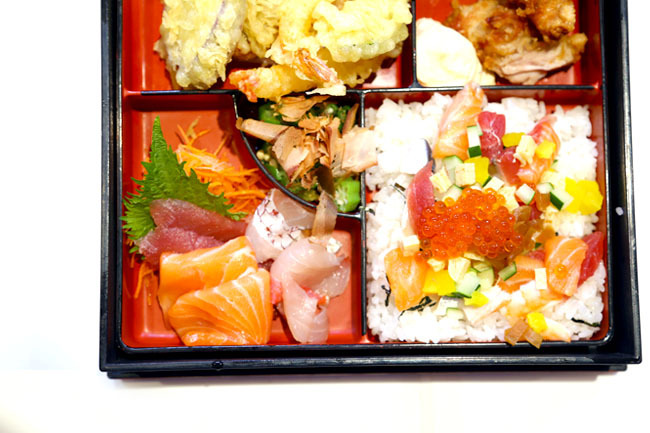 You can’t fool around with the Japanese in terms of food. Service-wise, they were obviously short-handed. But at least staffs were polite and tried their best to serve well. 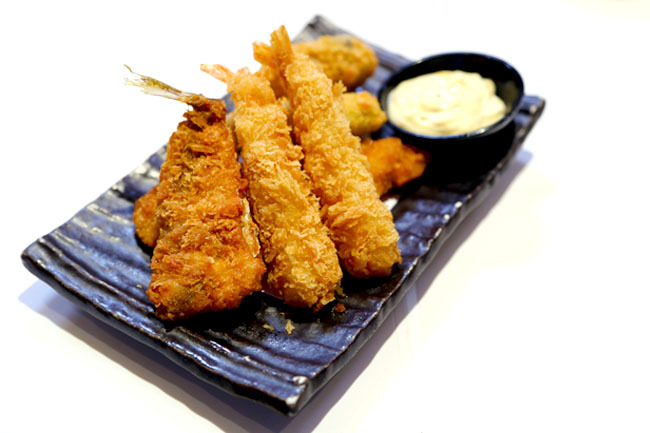 If cold sushi is not your cup of tea, a selection of hot food such as noodles and donburi are on its menu too. My other choices such as Maguro Avocado Salad ($8.60), Assorted Tempura ($10.60), and Tori Karaage ($5.80) though not spectacular, were certainly better than the average sushi shops (which shall remain unnamed). All these plus 8 pieces of fresh sushi and Chawanmushi came up to less than $50 for three persons. No wonder the long queue during the weekends! My husband and I are still on the search for good sushi after having tasted one of the best in Tokyo at Midori. We decided to try Ikeikemaru today upon reading your recommendation. We were warmly welcomed when we stepped in and placed our orders shortly. A while later, we were given a stack of clean coloured plates by a Japanese chef without any explanation. Seeing that he doesn’t speak English, I didn’t bother to ask what those plates were for too. After our meal, we asked for the bill. We were puzzled when the waitress started counting those clean plates together with those on our table and we asked what were those clean plates for. She explained they were for the sushi we consumed. That made us more puzzled as those sushi consumed came served on coloured plates too! If what she said was right, then that would mean we are charged twice! So my husband was explaining to her why it shouldn’t be so, and the waitress just stared at us blankly. Fortunately, one local chef behind the counter heard us and explained that the clean coloured plates were for the assorted sashimi that we had! You hardly get charged coloured plates for consuming sashimi isn’t it? At least those restaurants I have been to don’t do it this way. So anyway, we paid and received little thank you(s) from the staff. We felt this restaurant somehow doesn’t quite welcome locals and suffice to say, this shall be our first and last time.